This section contains images of the Roman Fora. 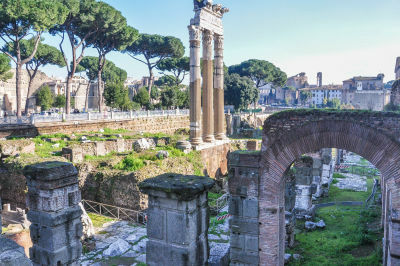 "Fora" is the plural of Forum and in this context refers to five different Forums that were built by five different Emperors: Julius Caesar, Augustus, Vespasian, Nerva, Trajan, and the Column of Trajan. These Fora are located just to the north of the much more visited—well–known—Roman Forum. In the Imperial Period, they were centers of religious, commercial, political, and cultural activities.